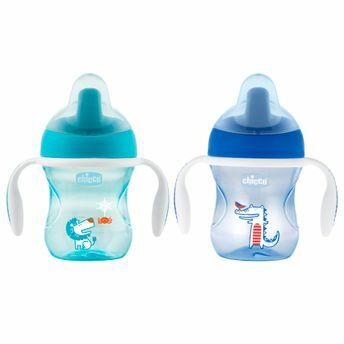 Chicco Natural Fit Semi Soft Spout Trainer Cup is bite-proof and really stands up to teeth! With a unique groove on the spout to guide lower lip positioning, it is the perfect cup for teaching little ones to drink on their own. This spill-free cup keeps things tidy too. Gentle sipping activates the flow of liquid through a removable valve, so you can flip the cup upside down and all around without leaking a drop of baby's favorite drink. Take out the clear, one-piece valve for easy cleaning or for free-flow drinking practice. The non-slip handles are shaped for little hands to hold onto but can be removed for cup holding practice. Ergonomic indents guide hand placement for picking up and holding while drinking. Calibrations are marked on the cup to keep track of liquid intake. Plus, the snap-on lid keeps spout clean when not in use. Parents love this cup for its easy to clean, minimal parts. All parts are top rack dishwasher safe for convenience.